Oh my gosh. I am so humbled by all of the support I have received from this fabulous TpT teaching community. I just LOVE sharing resources and collaborating with other teachers. This past week, I reached a personal milestone of 1,000 followers on TpT. I am simply blessed and I wanted to celebrate by planning a giveaway! I LOVE creating gift baskets for different events and holidays. 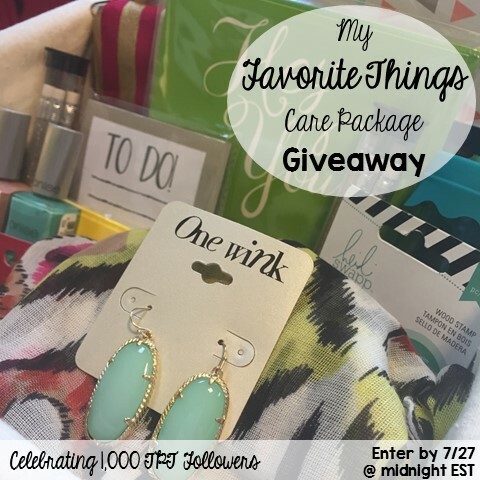 I decided to put together a cute little "My Favorite Things Care Package" for one lucky winner. Who doesn't love getting a fun package with goodies in the mail??? Including a fun scarf with matching earrings, 2 nail polish colors, to-do list notepad, patterned file folders, glitter pencils, and MORE! To enter, simply complete the Rafflecopter at the bottom of this blog post... it's super quick and easy! Share this image out on Instagram and Facebook to help spread the word! Enter by midnight on Monday, July 27. One lucky winner will be announced on Tuesday! I will put the care package in the mail by early-mid August... just in time for back to school! As part of my celebration, my TpT store will be discounted 20% on July 26 and July 27. Grab those must have back to school items!! Here's a link to my store! Oh my gosh! I may have to go back and get another pair for myself!! DSW! Thank you!! You are well on your way there, too! Nicole what a fun treat! And congrats on your following. WOW! 1000 people. Yay Yay! So happy for you! Girrrrl you is a baller!